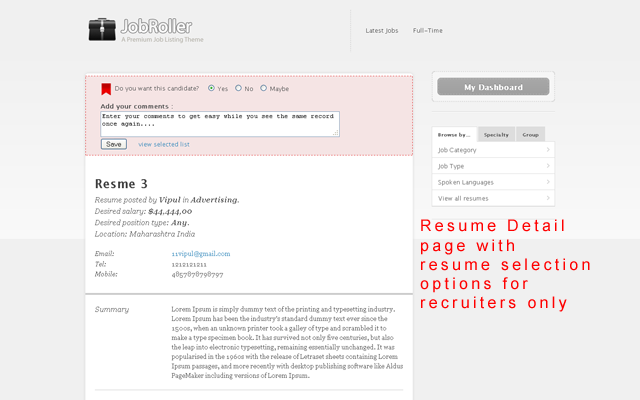 The plugin gives additional feature for JobRoller theme recruiters (Job Listers) to select resumes & add related comments with resumes to help the resume selection for future revise. Resume selection the easy way. 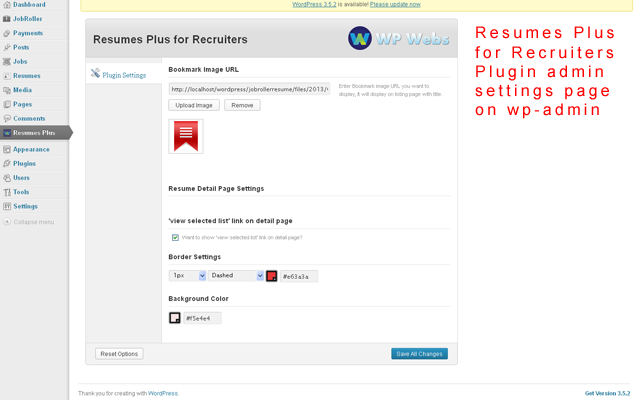 The plugin will affect only for recruiters (user type = ‘Job Lister’). No else can see anything. Only for recruiters. The options to select resume with comments on resume detail page. Selected resumes list with comments added. Selected resumes list tab under “My Dashboard” with title of “Selected Resumes”. “Unselect” option to remove resume from selection list. Shortcode for selected resumes list page. Bookmark image with resume title on listing page for indication. –> It will automatically linked with list url. 4)You can see additional “Resumes Plus” menu link at left menus wp-admin. 6)Read Usage & Notes Carefully. You can contact us directly via email (info(@)wpwebs.com) or support under forum in the AppThemes forum. –> To enable search function you need to make change(add code) in two theme files. we have added only one line code for two files to make it easy without any error. — SSL enabled but not work for some server, problem solved. — site with SSL certificate, mean for https:// site js & css may not working – problem solved. 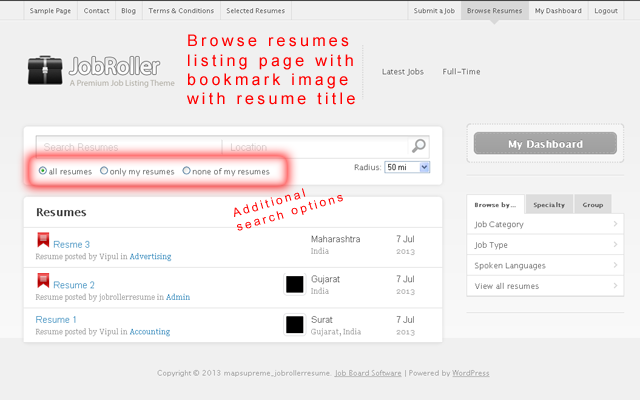 — Plugin users options added as per settings from JobRoller theme > Settings > Resumes > Resume Visibility — settings. As it’s plugin, it will work with all child theme of jobroller. Please I want to know those options are for ADMIN or all of them for any job lister inside our site? is there a way that we give those options to job listers who paied only? comments will be seen by the job lister ONLY not buy the admin? mean can the admin see those details for companies/job listers? And please, those comments will be on uploaded/attached resumes or the form that Job Seekers fill? If on attached, this mean ur plugin provide seeing the attached resumes inside the dashboard? HI admin can see all listing while only users who has permission to view the resumes can select it and add comments. Related to only paid member can view the comments, it mean you may need to add addition code/conditional code for that in our plugin code. Add comments to people who applied to their Ad or to any resumes from Browse resume? I have added some selected resumes, you can check it on demo, even I am going to disable the “deselect” option so it will never remove from demo. Thanks but would u please replay to my q as i am having to re-asking them? 2) Add comments to people who applied to their Ad or to any resumes from Browse resume? can it be both? 3) And please, those comments will be on uploaded/attached resumes or the form that Job Seekers fill? ==>Yes all listing mean all resumes. ==> There is no form or job seeker only for recruiter only. The plugin will work only after resume is uploaded. Even there is not any upload/attached resumes with comments. There is no form or job seeker only for recruiter only. The plugin will work only after resume is uploaded. whether that Project Manager uploaded his resume or no ? Hi the plugin only works like if there is any resume already added, the job Lister can find the job if match the requirement. Job lister can add any comments/remark related to resume he has views so he can get idea what resumes he may have seen and any special comments from him. if the job lister select “Do you want this candidate? ” to “yes” then only the resume will appear as selected resume list. Regarding to your comments, whether the job lister can see the attachments with resume will work as normal job roller theme feature. By our plugin there is not such attachments facility or any thing. The only feature of our plugin is job lister can browse the resumes, select if he likes and add comments if any. From our side there is not any limitation of use for how many site it will used. I think you can use without limit. I have little bit confusion what you want to say “to pick up and not, and also for the vantage theme “. Will update plugin soon for related update. Please create topic on forum so we can discuss for that. I have send related issues to appthemes team and they will reply you to the forum topic you have created. Thank you for the quick follow-up. I was excited to get this plugin, but for some reason I am not able to make it work. I am using Olinda. It is activated and everything. Am I missing something? You can able to see the options to select resume as per screen image on this page and also given screen image with plugin folder. Looking to purchase this plugin, but it is not saving when I edit/update comments in the demo – is this a problem with the demo only? Yes it’s because of demo. This is such a great extension that I bought it. However, it is not working with my theme, Olinda. Is it possible you could help me with that? Anything would be great. please create forum topic. Also follow the user guide how it’s working. The plugin will appear only for the user type = recruiter only. No else can see it. There’s absolutely no way to get it to work for the normal job lister? The users who can browse resumes, they can see the plugin feature. Because if they cannot see the resumes, how can they select the resume for their listing? so make sure while you checking the plugin is active and you can see the browse resumes and see resumes detail pages. Hmm…it’s not appearing with the resumes, but I can see the menu item under the job lister dashboard. I mean if you have rights to see resumes, you can see the plugin options. 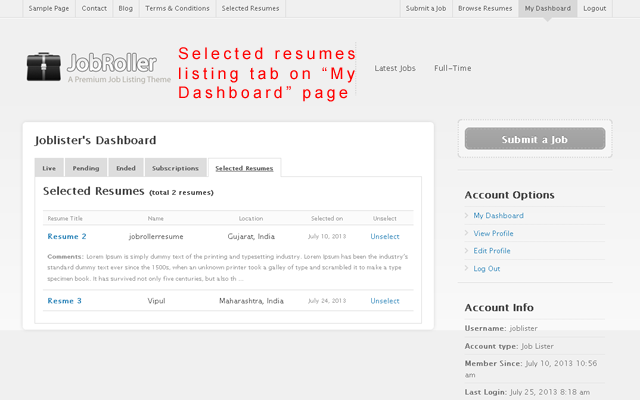 Yes the selected resumes list link will appear under dashboard page. Is this plugin compatible with latest WP and Job roller version. I see that it was last updated in August 2013. Another thing I am not able to get demo to work. It is working as we have the latest demo on last update of jobroller. the selected resumes tab added. As all user come & test it so selected resumes may gone. But you don’t worry it is working for latest jobroller theme. I think this question may have been answered somewhere but I just want a confirmation. Does this plugin allow jobseekers to upload one or more of their resumes in file formats such as Word or PDF? job seeker upload resume related settings may be not past of plugin. you can download plugin zip file from my dashboard. just to make sure : is this has been tested with last jobroller 1.7.5 ? Hi sorry for delay, yes it will work for jobroller 1.8+ . Are there any conflicts with FXtender Pro..? This plugin allow recruiters to select the resumes that they can see. No other controls by this plugin. Recruiters can select the resumes and shortlist and add comments for those resumes…..
Is this plugin going to allow recruiter upload the resumes? as for now jobroller theme is only allow admin to upload resumes. upload resumes only can be done my job seeker only. The plugin only allow recruiter to select/shortlist the resumes as per their requirement. Plugin not have functionality to upload/add resume by recruiter. Hi there, the plugin is crashing on me. Where can I get support for it? By the way would you like to share your problem in more details that when you facing the problem and if possible also send your site url. Redesign your ClassiPress site without using a child theme.